Um yes. You heard me correctly. Made in your kitchen. At your home. By yourself. With all of your own things. And no dry ice! Oh yeah, and Nutella dipped cones. With neon spraaankles. Okay so here’s the deal. You might remember last summer when I LOST MY MIND over this mascarpone soft serve that Mandy from Lady and Pups posted. It is quite possibly my most favorite food photo to ever grace the internet, but that’s neither here nor there. The recipe is to die for. I don’t have a soft serve machine. The reviews are always so… MEH… that I can’t bite the bullet. I don’t want to burn my face off with dry ice. Or deal with it because I’m lazy. To be honest, I’m actually extremely angry at the moment that this recipe is not in my face. That it’s all gone. That we ate it all. I just want to eat it again. Forever! So I based the Nutella soft serve off of Mandy’s and changed the recipe only ever so slightly. I kept the mascarpone because I use it frequently in ice cream anyway and find it adds the most fabulous creaminess. It is SO good. The thing is that this isn’t as easily meltable as it looks – I mean, it totally IS, it is similar to regular soft serve. But it’s manageable to make and serve to others. It was a struggle to photograph, but that’s a whole different ball game, and I just want you to know that it’s certainly doable on a hot summer night. I should have had a team of five people here to pipe it out and hold the cones and make the cones all pretty and what not. These photos here are all I was able to salvage, but since I’m probably going to make this for the third time this weekend, I might go ahead and add more. To make the swirl, I scooped mine into a piping bag. It’s not necessary unless you’re a millennial food blogger who thrives off of comments that people leave her on the internet. Otherwise, YOU’RE GOOD. It doesn’t change the taste. But really. 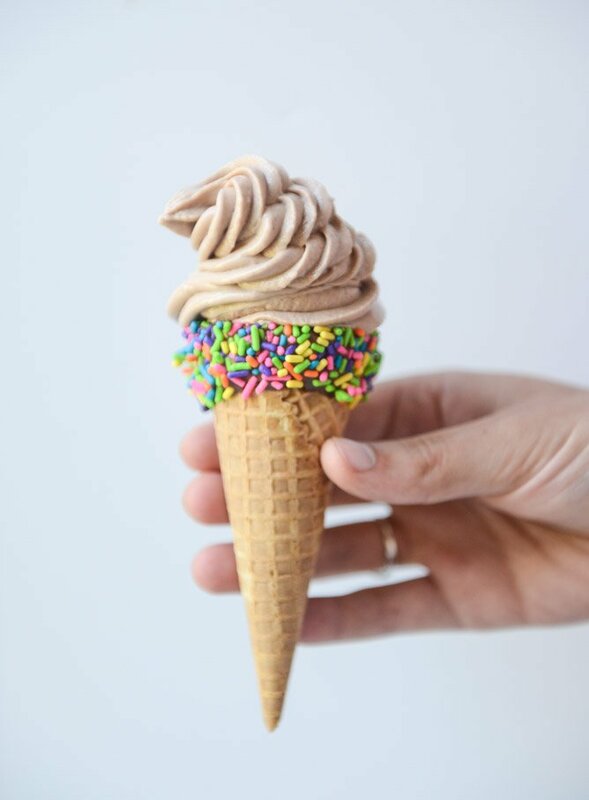 Nutella soft serve. !!!! Place the whole milk and condensed milk in a saucepan and heat over medium heat. Once it’s warm and bubbling along the edges, sprinkle the gelatin over top and let it sit for a minute. Whisk until the gelatin dissolves, then remove the mixture from the heat. Whisk in the mascarpone cheese, nutella and salt until completely melted and combined. Mandy recommends an immersion blender here, but I really loathe my immersion blender so I just continued to whisk and it worked out perfectly. Pour the mixture into a baking dish (9-inch square works well) and freeze for at least 6 to 8 hours or overnight. Right before serving, slice the mixture into cubes. Place half of the cubes in the food processor and pulse until they begin to break down, then turn the processor on and blend until creamy and smooth. If you’ve made banana soft serve with frozen bananas, it’s just like that. At this point the ice cream will be slightly melty, so you can pop it back in the fridge or serve it with a spoon, or place it in a piping bag and pipe into cones! Repeat with the remaining cubes and do the same. 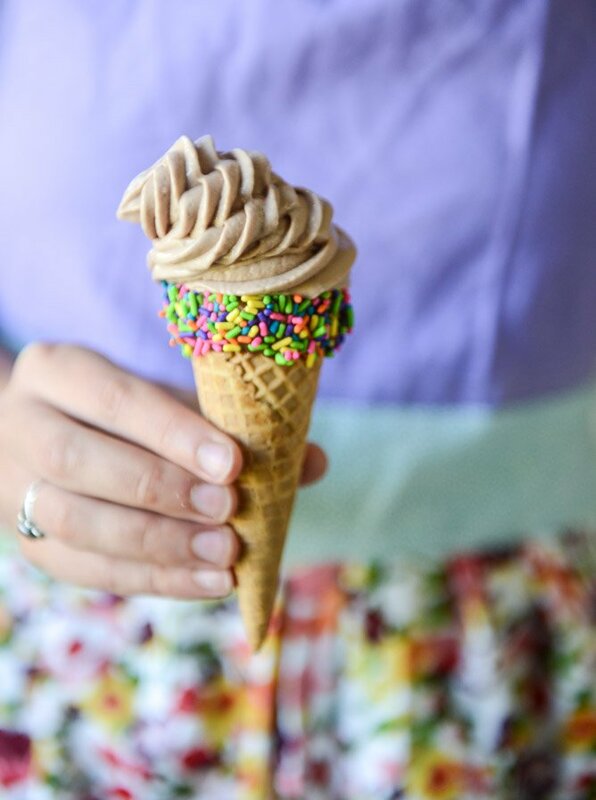 If desired, dip your cones into melted nutella and sprinkles before serving. You can do it ahead of time and stick the cones in the fridge too. p.s. remember when I hated Nutella? Thank god that’s over. One question – how do you manage to share this with others? I’m sure I would eat the whole bowl myself and bark at anyone who’d dare to approach me… This sounds amazing! I can’t wait to make this…just bought a double Nutella package at BJs. I have a small ( 1.5 qt)Cuisinart Ice cream maker that makes perfect soft serve for immediate use. The machine was inexpensive and I got a deal that included a second bowl for free so I always have one in the freezer ready to use. I would make the mixture, refrigerate overnight and mix the next day. In less than 20 minutes, soft serve is ready! I love the neon sprinkles…where can I purchase them?? Thanks for the sprinkle info. If you do decide to purchase the small Cuisinart, you have to try the KAF recipe for dark chocolate sorbet. I use Valrohna cocoa and opt for the suggested 2 TBS of Kahlua. It is impossible to resist, freshly churned, right out of the tub. Hi Jessica! I think your pictures are beautiful! I can’t wait to try this. Love visiting your site every day! Lucky for us you like Nutella again. Reminds me of the oh so delicious hazelnut gelato from a vacation to Italy many years ago. To help fill the cones, I would try covering a bowl with foil, cut small holes in the top, and insert the cone to steady it. Happy weekend to you. thanks so much joanna! that is an excellent idea! LOLOLOL, self-awareness is the first step. ? Oh, this is definitely happening this weekend! And I get your immersion blender hate. I always end up either 1) wearing what I’m trying to blend and/or 2) splattering the mixture all over the ceiling, floor, walls, countertops, etc. Also not a fan of cleaning it for some reason. EXACTLY! i’ve tried even the best ones and i just find them to be a massive pain. yes, thank god! I don’t know how our friendship would fare if you still hated nutella… but this, this looks incredible! Could I pour the mixture into an empty ice cube tray? Would save slicing it… Thanks! that is an awesome idea!! yes, i think it would work. not sure if twisting the tray would release them but if not, you could just scoop them out! i can’t deal. and just last night, i was wondering what to do with with a 1/2 can of sweetened condensed milk leftover from another adventure. i might have found its new home!! i always need a way to use it up too! HAHAHA! This is why I love you. I literally cracked up out loud (alone in my apartment…because millennial food blogger). BUT IT’S SO TRUE. wahhhhh. What do we do with the other half of the cubes? oops sorry lauren! you do the same thing, just do it one half at a time. putting it all in the food processor (even the large 14 cup one) would be too much at once. i fixed it, thanks. WOW! 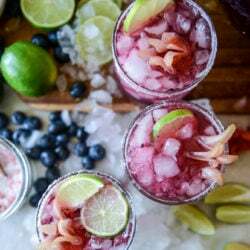 the stuff dreams I made of…. This is EVERYTHING!!!! Car keys in hand heading to get ingredients now!!! Oh my poor diet, oh well!! Two pieces of feedback – one, you forgot to mention when to add the vanilla – I just added it with the other ingredients at the end. Also, I’d whisk the gelatin constantly for that one minute – I let it sit and it just clumped and we had to fish it out. I did try it in ice cube trays, and meh – it was a pain to get out so next time I’d do it as written. Love love love this! I love that you love nutella now and this soft serve OMG! I LOVE this method of making soft-serve! I have so many people ask me how to make ice cream without a maker and this is SO much better than churning by hand!! Beautiful pictures! My husband LOVES Nutella! He will love this ice cream! Mine had a weird consistency. Like whipped yogurt. any suggestions? I liked the flavor. Mine was like a mousse and a whipped consistency. So sad! It didn’t have that ice cream coldness to it. The favor was amazing! Oh no, I did not just read this. I’m obsessed with nutella, I try every single recipe I can find of it and this one won’t be different. It looks so yummy! I absolutely love it! Thank you so much! I’m loving your blog!